Microsoft added a new security feature called SmartScreen Filter to the company's Internet Explorer 8 web browser. The filter has been designed to warn users when unsafe websites are accessed in the web browser. This covers outright malicious sites that attack the browser or underlying system directly, phishing sites, sites that use other attack forms such as drive by downloads, and anything else considered unsafe by Microsoft. The SmartScreen filter checks the website that is about to be opened against a list of "high traffic website addresses" stored on the computer system. This list is maintained by Microsoft and contains references to legitimate high traffic sites. Any address that is not included on the local list is send to a Microsoft server where it is checked against a database of unsafe and suspicious sites. Some computer information and the SmartScreen Filter version number will also be transmitted in the process. Information that may be associated with the address, such as search terms or data you entered in forms might be included. For example, if you visited the Microsoft.com search web site at http://search.microsoft.com and entered "Seattle" as the search term, the full address http://search.microsoft.com/results.aspx?q=Seattle&qsc0=0&FORM=QBMH1&mkt=en-US will be sent. Address strings might unintentionally contain personal information, but this information, like the other information sent, is not used to identify, contact or target advertising to you. In addition, Microsoft filters address strings to try to remove personal information where possible. From time-to-time, information about your usage of SmartScreen Filter will also be sent to Microsoft. This may include the time and total number of websites visited since an address was sent to Microsoft for analysis. Some information about files that you download from the web such as name and file path may also be sent to Microsoft. Some website addresses that are sent to Microsoft may be stored along with additional information including web browser version, operating system version, SmartScreen Filter version, the browser language, and information about whether Compatibility View was enabled for the website. A unique identifier generated by Internet Explorer is also sent. The unique identifier is a randomly generated number that does not contain any personal information and is not used to identify you. This information, along with the information described above, is only used to analyze performance and improve the quality of Microsoft products and services. The SmartScreen Filter is a security addition to Internet Explorer that warns users if known malicious or dangerous websites are visited. It is therefore recommended to keep the filter activated when Internet Explorer is being used unless other means of protection are implemented. Some Internet Explorer users on the other hand might prefer to deactivate it. Either because they are using a security software that checks the websites for them, like Web of Trust for instance, a security software that integrates in the web browser and checks the accessed websites, or because they do not want to transmit information about the visited websites to Microsoft. 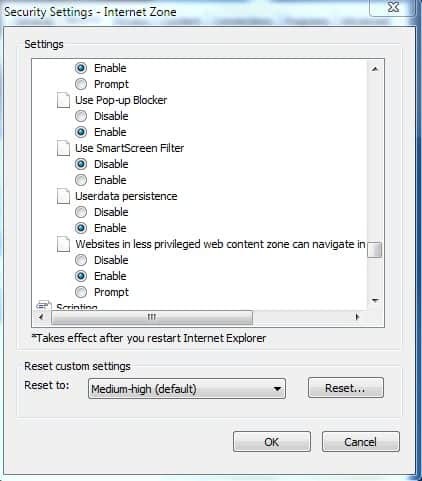 The SmartScreen Filter can be disabled in the Internet Options of Internet Explorer. Open the Internet Options by clicking on Tools > Internet Options and switch to the Security tab. If the main menu bar is not shown in Internet Explorer, tap on the Alt-key first to display it before selecting Tools > Options. You have two options to configure SmartScreen. First, in the Advanced options. Go to Advanced and scroll down until you find "Enable Windows Defender SmartScreen". Uncheck the option and click on ok to turn it off completely. The second option gives you more control over the feature as you can turn it on or off for individual zones. Select the Internet Zone and click on the Custom level button. This opens a new window with lots of configuration options. Scroll all the way down until you find the Use SmartScreen Filter setting; it is enabled by default. 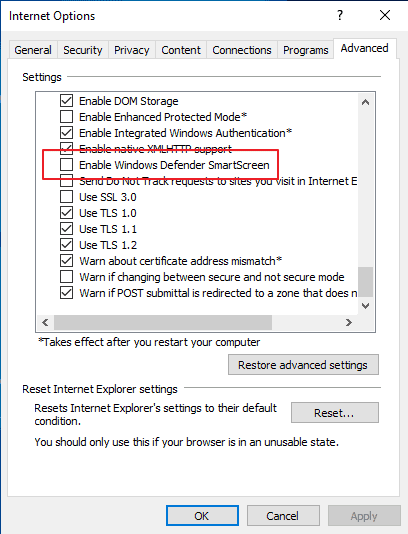 Switch the value of the setting to disable instead, and click on ok afterwards to save the change to turn off the smartscreen filter in the Internet Zone of Internet Explorer. You need to confirm the changes. This will disable the SmartScreen Filter in Internet Explorer 8 so that no visited websites and computer information will be submitted to Microsoft. It is also possible to turn of the SmartScreen Filter by clicking on the Safety link in the Internet Explorer toolbar and selecting SmartScreen Filter > Turn Off SmartScreen Filter. This menu can also be used to check websites manually and report potentially dangerous websites. The last two options can be performed even if the SmartScreen Filter has been deactivated in Internet Explorer. Find out how to turn off the SmartScreen Filter in Microsoft's Internet Explorer web browser on machines running the Windows operating system. Thanks so much! Very helpful!! Sadly, even if you disable it via IE, this stupid program still will pop up and prevent you from looking at links from friends if you use firefox and chrome. This is very annoying. If anyone knows how to stop it please tell me. GET ME OUT OF THIS SSF IMMEDIATELY, PLEASE. IT’S CRAZY. Bypass the Microsoft Windows SmartScreen in Chrome instal the “Microsoft SmartScreen Bypass” extension, just search for it on the Google Chrome Extension portal. None of this stuff works. I have disabled this “smart” filter, which is obviously a stupid filter, everywhere I can find it, but I still have to tell it to accept the same sites over and over, but it continaully stops them anyway. My computer is just that. MY computer. I decide what I accept and do not, not Hackersoft or Hotmail. How can I get rid of it if I have a Mac and use Safari? SmartScreen Filter creates problems to software vendors who try to distribute updated version of setup or binary files on internet. Everytime an updated version is released, SmartFilter starts saying that the file is not commonly downloaded and can harm your computer. I’ve disabled the smart screen filter, and yet when i try to open pictures in my email, the “smart screen filter” does not allow me to view them???? first it says “This message looks very suspicious to our SmartScreen filters, so we’ve blocked attachments, pictures, and links for your safety. The IE9 SmartScreen Filter is destroying business reputation by falsely flagging software download links as “unsafe”. Please, do the world a favor and let virus scanners and persons more qualifed tell us what is safe … not random and often times clueless or malicious people reporting links as “unsafe”. SmartScreen Filter creates problems to software vendors who try to distribute updated version of setup or binary files on internet, its common knowledge for geeks. Everytime an updated version is released, SmartFilter starts saying that the file is not commonly downloaded and can download harmful files to your computer. Can’t turn off Smart Screen Filter, tried it all..
Great help! Thanks very much. this is very helpful, thank you very much. What is so smart about it?